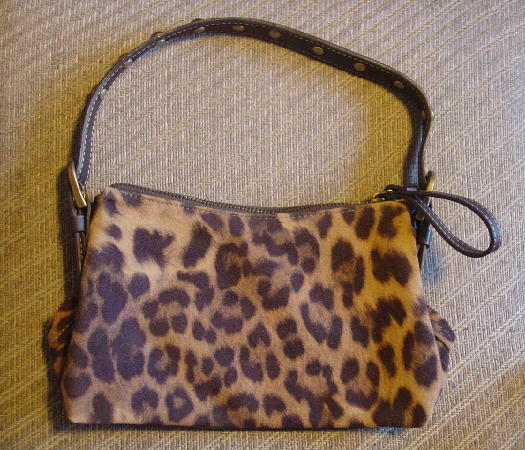 This never-used all manmade materials purse is by Nine West. 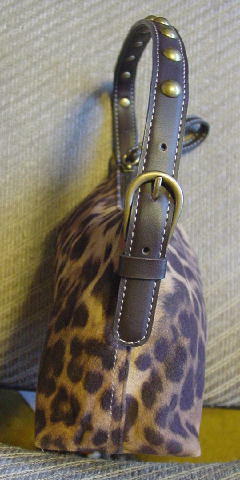 It has an animal print pattern in dark brown, light brown, and light sandy-tan, and the fabric is very soft and smooth. The bottom and handle are in a dark brown faux leather with white accent stitching. The handle buckles on both sides and has 10" brass-tone rounded tacks. It has a top side to side zippered opening with a large loop pull. There is a dark brown fabric lining with a zippered pocket. A Los Angeles model got it as a birthday present.